It is time again for a new release from Box Whisky, Sweden. 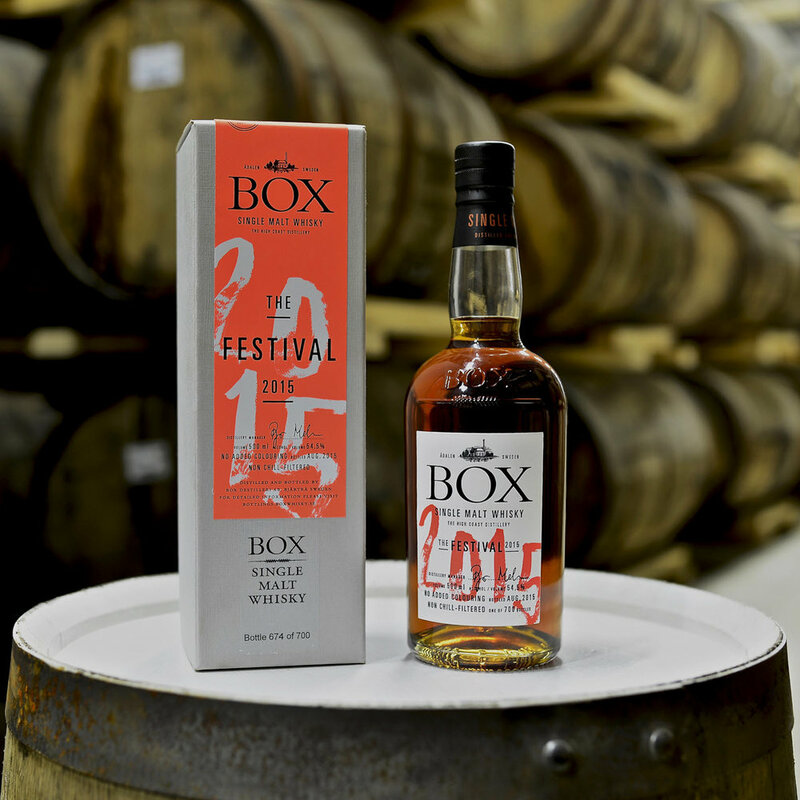 The Box Whisky The Festival 2015 was made available exclusively to attendees at the Box Whisky Festival this summer. You can read all about the festival itself and the mad queuing for this special bottling here. If you were lucky enough to attend the festival, and even more lucky and managed to get a certificate to buy this bottling, you could pick up your bottle in September at a cost of SEK 889 for a 50 cl bottle. Nose (23/25): Quite sweet, with lots of bourbon influence. I also find a lot of oak - the relatively fresh kind. The oak never gets over-powering, and although it gives a clear indication that we are nosing a young whisky, it is still well-balanced and rich. The peat is more a teasing tickle that a slap in the face. A bit of fudge, and mild fruit notes. I will assume this dram needs to sit in the glass for a while ... (time passes) ... Yep, I was right, and what a positive difference it makes! The bourbon and oak notes are now a lot more harmonious, and the peat is slowly stepping out of the shadows. The tempered sweetness on the nose is sublime. Taste (22/25): Super smooth initially, then it quickly turns more chewy and rambunctious (yes, it is a word - look it up). Pepper - bordering on chili, rich vanilla flavored fudge, and a touch of oak. Finish (22/25): Chili-licorice hard candy dancing on my tongue, and super-rich caramel sauce that is just on the right side of the getting burnt. So, so rich! Medium to long finish. Vanilla ice-cream covered in said caramel sauce right up to the end. Balance (23/25): What a lovely dram! This is a dessert in itself. In fact, you might even get away with skipping dinner altogether! This is the best official bottling I have tried from Box so far.